A period of atrocious weather was very productive for getting up to date with IPMR and rarity descriptions; It was not, however, very productive for practical field ornithology. A Sparrowhawk on the 24th was just about the only new migrant recorded, and a flock of 34 Long-tailed Ducks sheltering in Linklet Bay on the 27th was a notable count; but the few other birds that were seen were presumably those that had failed to fly south before the gales and hailstorms hit: 10 Tundra Bean Geese were still around on the 24th, up to 27 European White-fronted Geese and the Barnacle Goose were present throughout, and 1 of the Woodpigeons was still near the observatory. We have done our best to take advantage of the rough weather and have been out catching waders on Gretchen Loch most nights. Several Purple Sandpipers, Turnstones and Golden Plovers have been ringed, along with a few Sanderlings and Ringed Plovers that have been roosting in Nouster Bay. 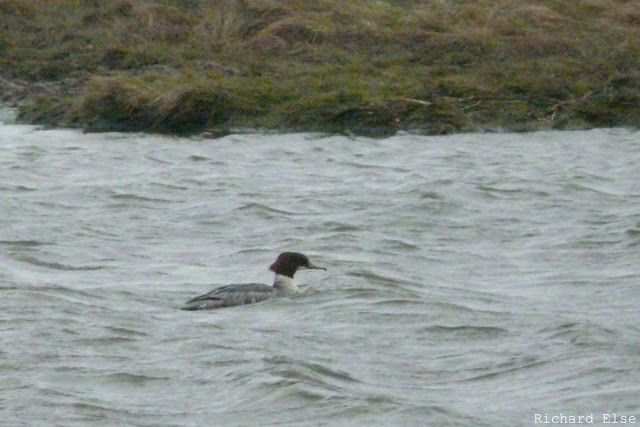 The best new birds of the day were a very late Wheatear, a Little Auk and a new Little Grebe on Gretchen Loch. Other birds seen included much the same collection of geese as the previous day, 3 Woodcocks, the 2 Woodpigeons and the Blackcap. 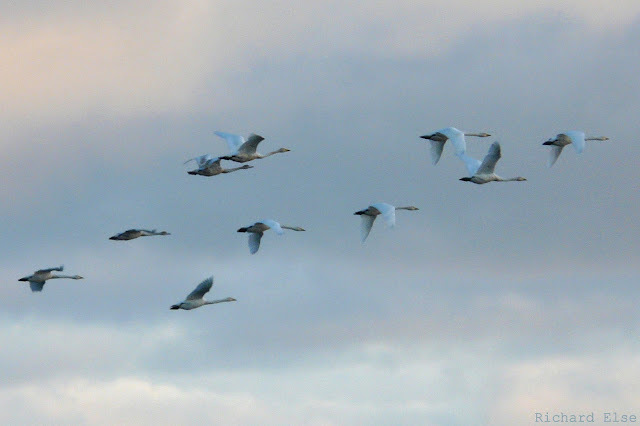 A flock of 19 Whooper Swans flying south down the east side of the island was the highlight of a very quiet day. There were still a Barnacle Goose, 10 Tundra Bean Geese and 37 European White-fronted Geese among the Greylags, the 3 Scaups and 2 Woodpigeons were still present and a Common Redpoll, a Blackcap and a Chiffchaff were at Holland House. New birds included a smart male Black Redstart, a Peregrine and 2 Hen Harriers. The goose flocks contained 26 European White-fronted Geese, 2 Tundra Bean Geese and a probable Taiga Bean Goose, and the 3 Scaups were still on Ancum Loch. Again, there was little change to report. A couple of Dunnocks, a Chiffchaff, a Brambling and a Chaffinch were the passerine highlights and a Woodpigeon and a Long-eared Owl were still present. The 3 Scaups, 9 Tundra Bean Geese, 23 European White-fronted Geese, 6 Pink-footed Geese and the Barnacle Goose were all recorded again during the census. Virtually nothing new was seen, and the only lingering species of note were 17 Tundra Bean Geese, 20 European White-fronted Geese, 2 Woodpigeons and a Long-eared Owl. Most of the day's excitement took place in the very small hours of the morning when, during a nocturnal ringing excursion in search of waders and geese, the long-staying and increasingly elusive Baird's Sandpiper made its first appearance for five days in the ringers' torch beams. It was duly trapped, becoming only the third of its kind to be ringed in Britain. 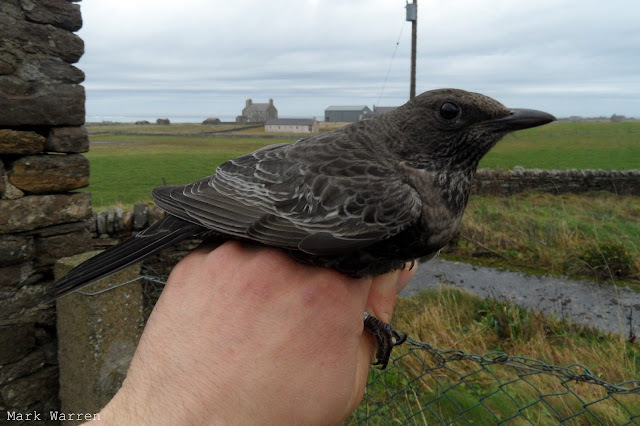 The previous two were also caught at bird observatories: Fair Isle in 1991 and Bardsey in 2004. 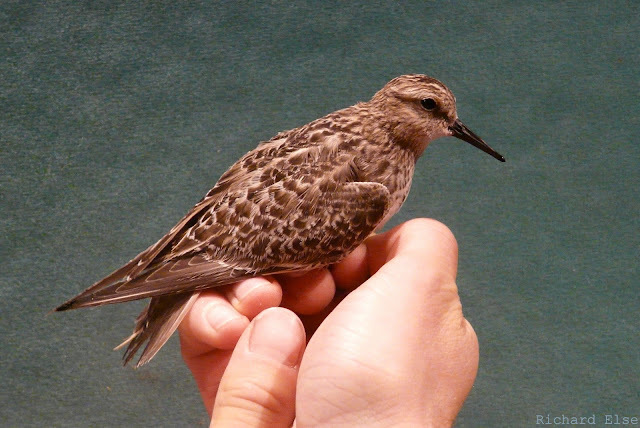 Although the biometrics fell mostly in the overlap zone, the Baird's Sandpiper was towards the small end of the scale and probably a female. There was almost nothing new to report from a very quiet day's migrant census, but notable species still present on the island included at least 22 Tundra Bean Geese, 6 Pink-footed Geese, 26 European White-fronted Geese, 1 Barnacle Goose, 3 Scaups, 1 Goosander, 2 Little Gulls and 1 Woodpigeon. The best of the passerines were a Rook, a Dunnock, 2 Chaffinches and a Brambling. All three Long-eared Owls were caught at Holland House: 2 were new birds, the other was ringed here earlier in the week. A second-winter Glaucous Gull and a Mute Swan were the pick of a very thin selection of new birds. A thorough goose count wasn't done, but 6 Tundra Bean Geese, 10 Pink-footed Geese and 10 European White-fronted Geese were seen and 3 Whooper Swans were still present. The Goosander, 3 Scaups and 2 Common Scoters all remained from earlier days, as did a Woodpigeon, a Collared Dove and a Black Redstart. There were 3 Long-eared Owls in Holland House garden, 2 of which might have been fresh migrants. The only new birds of note were the first Collared Dove since the summer, a new Hen Harrier, a Grey Wagtail and a Blackcap. 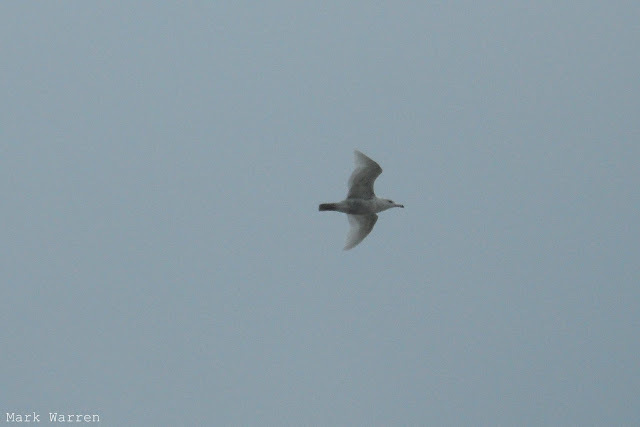 Remaining birds included a Sparrowhawk, a Little Gull, a Woodpigeon, 2 Black Redstarts and 2 Chiffchaffs. The number of European White-fronted Geese increased to 48 birds, breaking the island record for that subspecies. 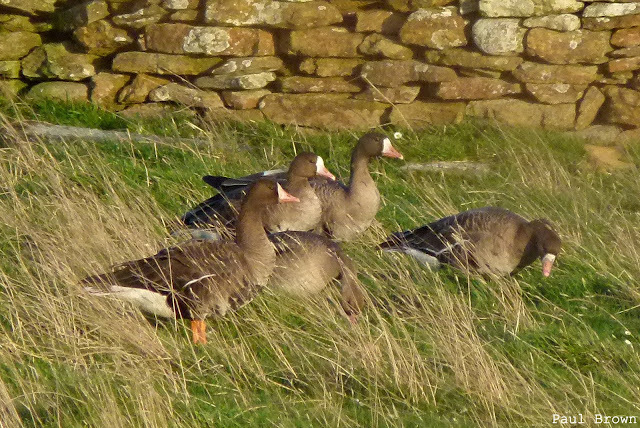 Counts of the other geese came to 22 Tundra Bean Geese, 11 Pink-footed Geese and the lone Barnacle Goose. Lingering uncommon ducks included the Goosander, 3 Scaups and 2 Common Scoters. North Ronaldsay's record Tundra Bean Goose count was toppled once again, with 23 now present around the island. 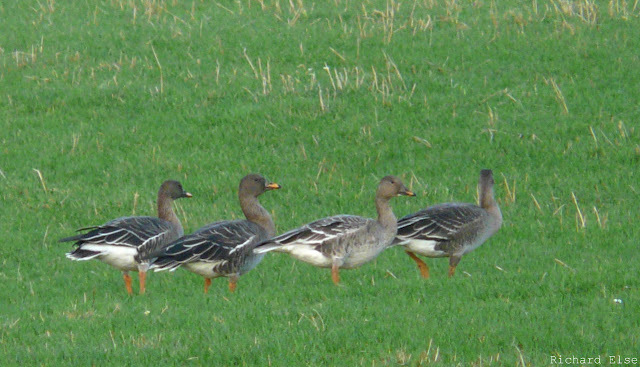 The number of European White-fronted Geese had increased to 39, and a single Greenland White-fronted Goose was found among them. The Barnacle Goose and 2 Pink-footed Geese were also still around and a fourth Scaup joined the 3 already present. Other sightings included a Sparrowhawk, the 2 Woodpigeons and 2 Black Redstarts. 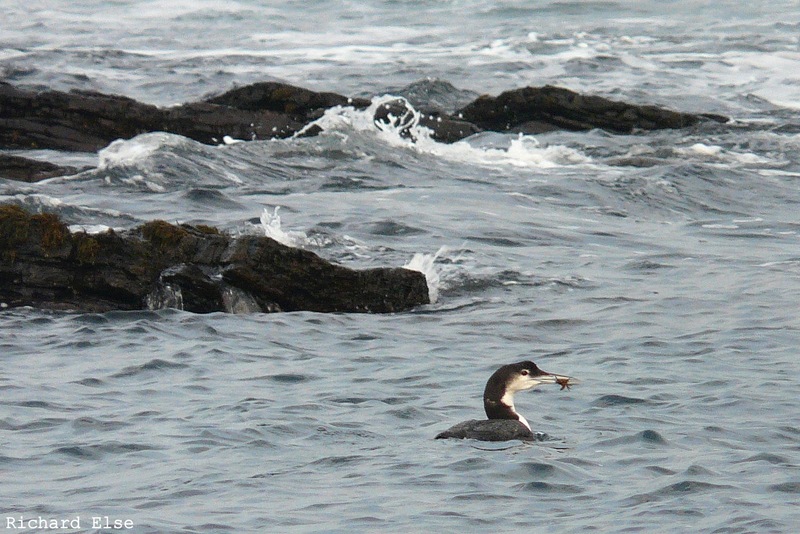 Divers, including a few Great Northern Divers, have been more visible than usual during the relatively calm weather of recent days. New birds were in short supply, but a flock of 180 Snow Buntings flying south over the island was the first significant movement of that species for a while. Counts of noteworthy landbirds came to 8 Woodcocks, 2 Woodpigeons, 5 Long-eared Owls, 4 Short-eared Owls, 4 Dunnocks and 2 Black Redstarts. Lingering wildfowl included 28 European White-fronted Geese, 5 Tundra Bean Geese, 2 Scaups, 4 Common Scoters and the Goosander. 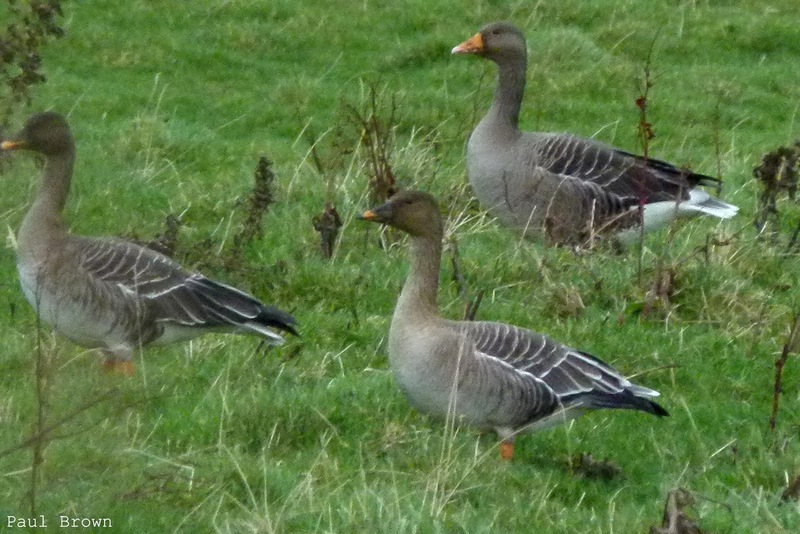 There were geese galore for a second day, with numbers of the scarcer species increasing even further: Tundra Bean Geese now numbered at least 18, and European White-fronted Geese reached 36. 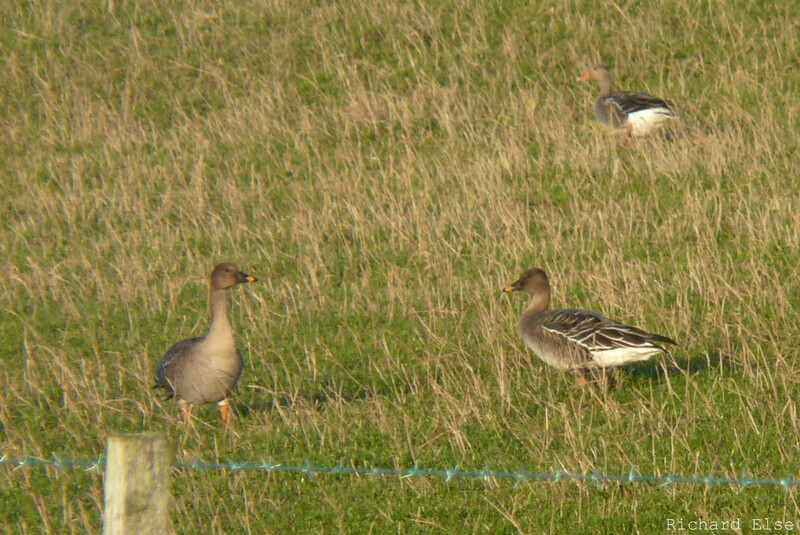 Also among 550 or so Greylag Geese were 7 Pink-footed Geese and a Barnacle Goose. Quite an array of ducks was on display too, including 2 new and 1 lingering Scaup, 3 Common Scoters and the Goosander, as well as multitudes of Wigeons and other common species. 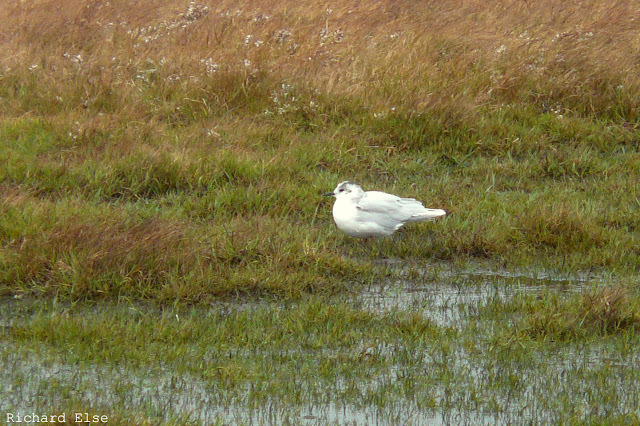 Just 1 adult Little Gull was seen, along with 3 Long-eared Owls, 2 of which were caught and ringed at Holland House. Other odds and ends from the day's log included 8 Grey Herons, 2 Woodpigeons, 1 Peregrine, 2 Hen Harriers, 3 Dunnocks and 5 Chiffchaffs. Wildfowl continued to bring plenty of the interest, with a real Anser bonanza enlivening a perfectly clear and sunny afternoon. At least 11 Bean Geese were the highlight, and a record count for the observatory: surprisingly, no more than 2 have ever been recorded here at the same time before. A notable count of 31 European White-fronted Geese was the highest for more than a decade, while 11 Pink-footed Geese and a single Barnacle Goose were also found among the flocks of Greylags. A drake Scaup on Ancum Loch was the best new duck of the day, the Goosander was still on Gretchen Loch, and 7 Common Scoters and 2 Whooper Swans were also seen. It wasn't all about the quacks though, and a variety of other noteworthy species all added up to quite a satisfying day's birding. A lot of gull activity in Linklet Bay included 6 Little Gulls which, again, somewhat surprisingly, appears to be the island's highest ever count of the species. As well as slightly increased numbers of common waders, the Baird's Sandpiper was still present on the links and a Grey Phalarope was on an inland puddle. A couple of Short-eared Owls and 5 Long-eared Owls were found, and a late Pied Wagtail was the best new passerine. The 11 Bean Geese exhibited bills of various shapes and patterns, but all were fairly stocky birds and we believe them to be of the tundra race rossicus. The only previous Bean Goose this year was a lone taiga fabalis bird that arrived in the middle of summer. 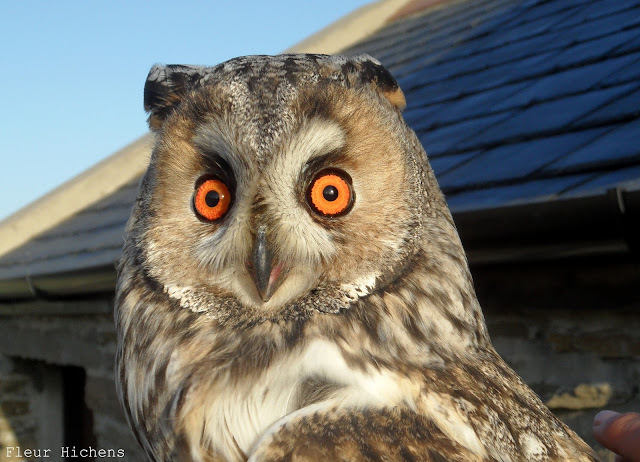 We have caught several Long-eared Owls this autumn, but none so easily as this adult male that was found sitting inside the observatory's newest Heligoland trap. Common Scoters are normally quite an uncommon sight from North Ronaldsay, but small groups were seen in various places around the island, including a couple that were swimming on Gretchen Loch in the company of a Goosander. Also unusual for the time of year was a lone Shelduck. A Pomarine Skua and a Glaucous Gull were seen during the morning census, and 3 Long-eared Owls were also present. 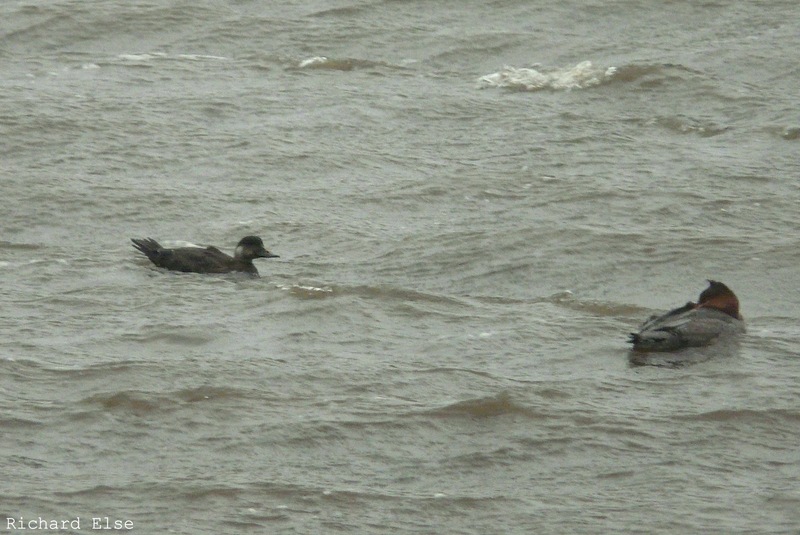 The Common Scoters (1 shown, top picture, with a Red-breasted Merganser) and the Goosander (lower picture) were among a busy array of ducks on Gretchen Loch that also included a Pintail, 5 Goldeneyes and 140 Wigeons. Another exodus of birds took place during the cloudy, but still very bright, moonlit night, with the numbers of all thrush species decreasing by more than fifty percent by the morning. A Rook, 30 Robins and a Wheatear were among a diminished selection of small migrants, and 34 Woodcocks and 3 Pochards were also recorded. There was more of interest among the contingent of long-staying non-passerines: the Baird's Sandpiper made a reappearance after a week's apparent absence, the Brent Goose was at the north coast, and both the Little Gull and the Swallow were seen again. An increase in the south-easterly wind and overcast conditions resulted in another substantial fall of thrushes on the island, along with a thin assortment of other migrants that included the first 2 Waxwings since January and a Lesser Whitethroat. The day's census counts of thrushes came to 886 Blackbirds, 563 Fieldfares, 245 Redwings, 46 Song Thrushes and a Ring Ouzel; totals of other passerines included 60 Robins, 6 Black Redstarts, 2 Wheatears, 15 Blackcaps, 4 Chiffchaffs, 4 Goldcrests, 2 Chaffinches, a Greenfinch and the same tardy Swallow. 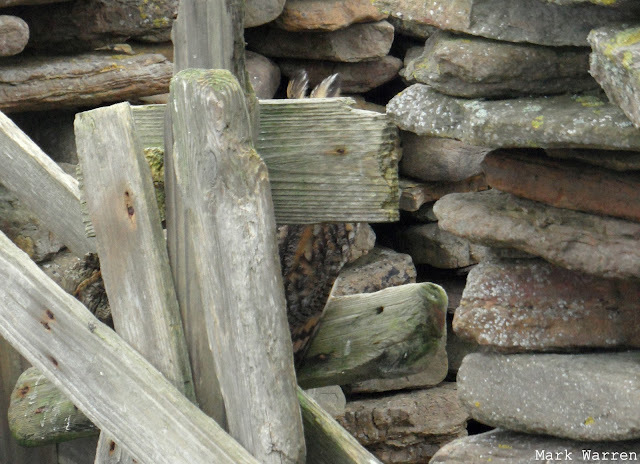 At least 49 Woodcocks were found on census, as well as 4 Short-eared Owls and 3 Long-eared Owls. A Pale-bellied Brent Goose (probably the bird from earlier in the week) was on Tor Ness, 11 Common Scoters were seen offshore and the Little Gull was still touring around the island. Besides an increase in the number of thrushes, comprising 103 Blackbirds, 275 Fieldfares, 167 Redwings and 9 Song Thrushes, there wasn't a lot to report. The Little Gull, 17 Robins and a Black Redstart remained from earlier days, 3 Short-eared Owls were seen and the lingering Swallow still hadn't moved on. The glorious spring-like weather continued but there were only a few new arrivals. Wildfowl numbers increased slightly with 213 Wigeons and 112 Teal counted. 2 Common Scoters were on the sea but the highlight was the second Pale-bellied Brent Goose of the autumn which flew past the north end. Passerine numbers continue to dwindle, although a Grey Wagtail was new, while 13 Robins, 2 Black Redstarts, 6 Blackcaps, 4 Chiffchaffs and 2 Lapland Buntings remained from previous days. Another pleasant but quiet day, with a visible clear-out of migrants overnight: just two new birds were trapped and ringed at Holland House during the morning's ringing session. A whole-island goose census revealed 653 Greylags to be present and with them 2 Pink-footed Geese. A couple of Pochards on Ancum Loch and yet another late Swallow were the only birds of note. The highlights of a fine, calm and sunny day were a juvenile Pomarine Skua flying over the island, 2 Little Auks and 3 Common Scoters offshore, and a mass arrival of 43 Tufted Ducks on Bridesness Loch. An arrival of Whooper Swans in the late afternoon comprised 13 birds on Gretchen and Garso Lochs. 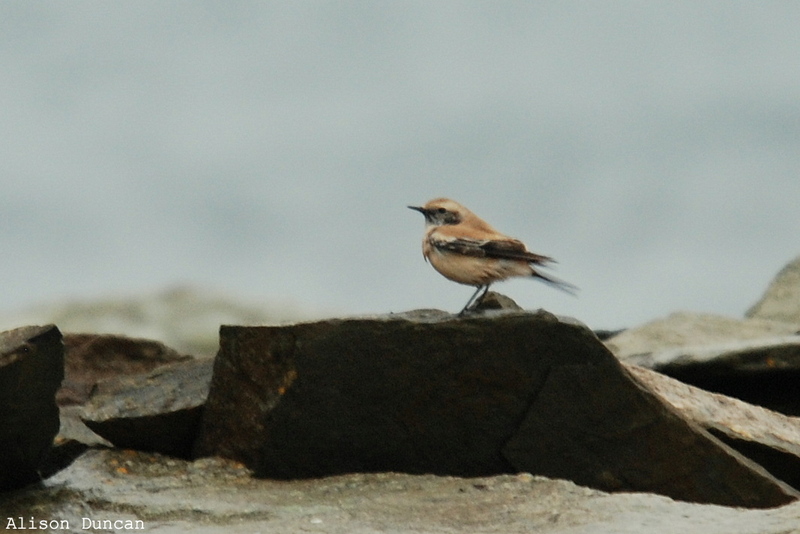 The Desert Wheatear remained on the west coast in the morning. The Desert Wheatear was still on the west coast of the island, and both the Iceland Gull and the Little Gull were seen again. 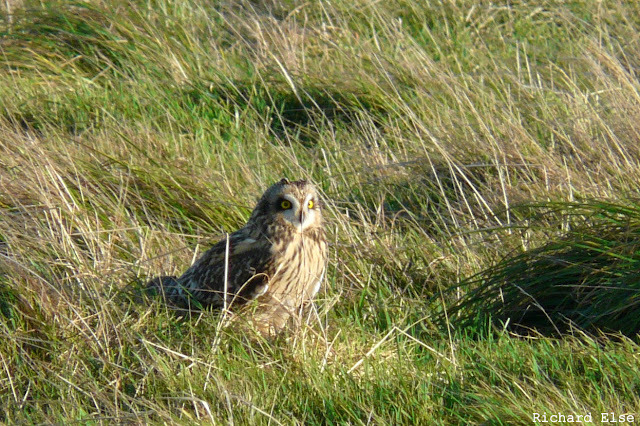 At least 8 Short-eared Owls and 1 Long-eared Owl were seen, and 15 Woodcocks were found scattered around the island. A Ring Ouzel and a Little Auk were probably the most notable new species, while a charm of 6 Goldfinches at Holland House was only a single bird short of equalling the island's highest ever count of the species. This particularly dingy specimen of a Ring Ouzel was the first to be ringed here this year. Of about 95 species that we have ringed in 2011, three have been additions to the observatory's all-time ringing list: White-fronted Goose, Grey Plover and Pechora Pipit. Although a day of frustratingly difficult, windy and wet birding conditions got off to an exasperating start with a large (although perhaps not that large) pipit sp. and a warbler (probably Acrocephalus) sp. 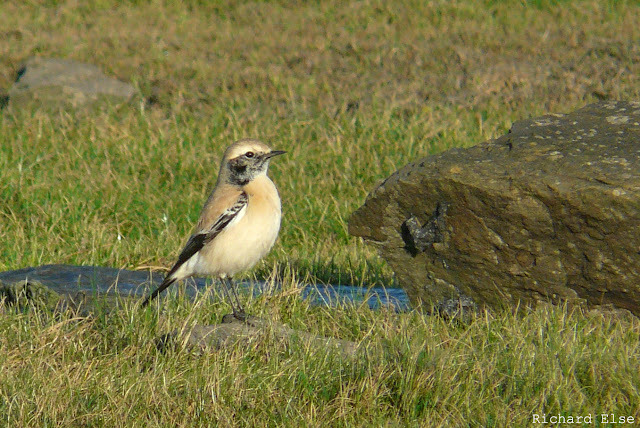 both evading identification in the irises at Ancum Loch, all was forgotten a short time later when the call came through of a male Desert Wheatear on the west coast. 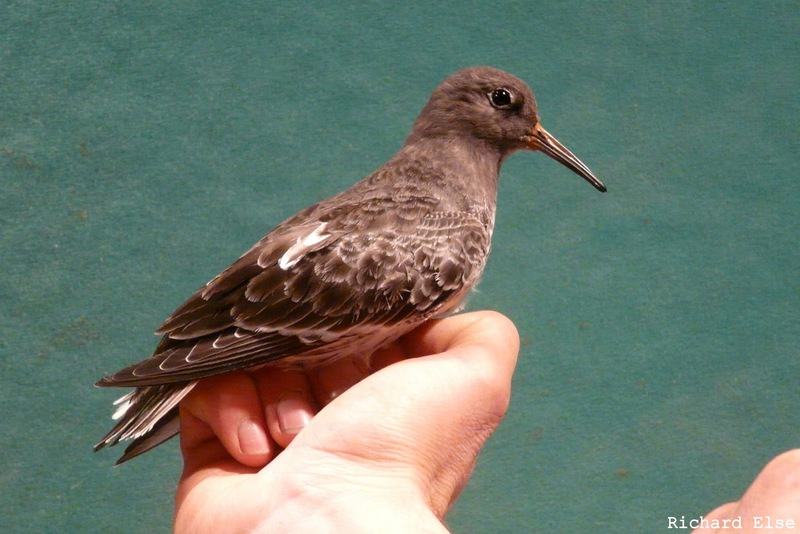 This is a new species for North Ronaldsay and the fourth record for Orkney. There had clearly been another arrival of thrushes on the island, with 1196 Fieldfares, 304 Redwings, 219 Blackbirds, 33 Song Thrushes and 2 Ring Ouzels recorded; and a variety of other passerines included a late Swallow, 6 Black Redstarts, 10 Robins, 5 Wheatears and the usual Short-toed Lark. A late Great Skua, a juvenile Iceland Gull and an adult Little Gull were seen, as well as 12 Woodcocks, 2 Short-eared Owls and a Long-eared Owl. A windy day didn't leave much worth reporting. The Baird's Sandpiper was still on the golf course and there was still a Short-eared Owl near the airfield, but the best new birds were a Little Gull in Nouster Bay and a Grey Wagtail. Numbers of most other species remained much the same, although the small group of Greenfinches at Holland house increased to 6 birds. Odds and ends continued to make landfall on the coasts, and a new Short-toed Lark was found in the rough fields at the north of the island while the lingering bird was still at Bewan. A male Stonechat near the lighthouse was probably the most interesting of the other new migrants, and counts of the more regular species included 31 Robins, 9 Black Redstarts, 1 Dunnock, 15 Blackcaps, 7 Chiffchaffs, 6 Goldcrests, 3 Chaffinches, 1 Brambling, 3 Greenfinches and 4 Goldfinches. The day's birds of prey were 3 Hen Harriers, a Sparrowhawk, 2 Merlins and a Short-eared Owl.